Get your torch and follow the archeologists into a journey at the footsteps of the great Greek philosopher, Aristotle! 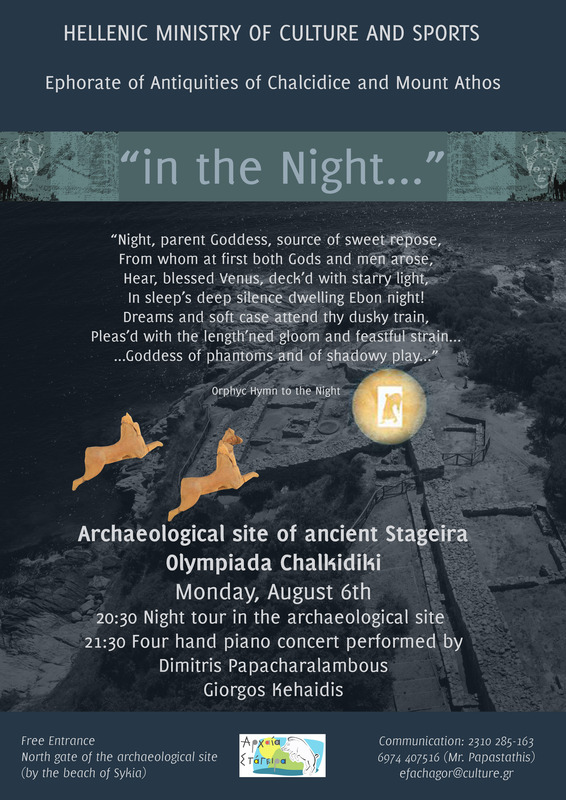 On August 6th, from 20.30 until 21.30, guests will have a unique opportunity to join a night guided tour to the most important archaeological sites of Halkidiki, Ancient Stagira, the birthplace of the philosopher, Aristotle! Guided by archeologists, visitors will walk through the alleys of the ancient city and step the roads that the man who influenced 2000 years of human history – Aristotle, did! Around 21.30, this journey through time will end up at “agora” (central public space in ancient Greek city-states) where 2 pianists, Dimitris Papaharalabous and George Kehaides will perform live.